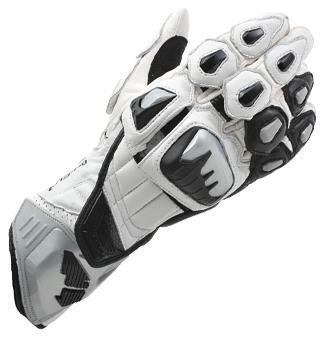 Japanese manufacturer RS Taichi has released a new race glove to their range called the NXT046 GP Evo Racing glove. The glove is made from genuine kangaroo leather and polyester has has TPU plastic protectors backed up by an EVA foam for cushioning. The hard knuckle armour in the back of the hand is split for better ease of movement and it comes with Knox’s SPS scaphoid protectors on the underside of the thumbs. They’re available in white, red, blue or black but prices have yet to be confirmed for the UK market.